SEOUL, SOUTH KOREA / ACCESSWIRE / March 21, 2017 / LGM, Inc., a subsidiary of Leo Motors Inc. (OTCQB: LEOM) unveiled their proprietary new electric powerboat propulsion system at the 2017 Busan Boat Show in Korea. The new LGM powerboat electric propulsion system produces up to 660 horse power (HP) and is compatible with most power boats and yachts. 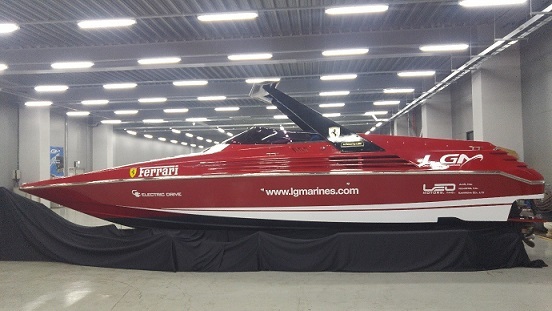 LGM converted the RIVA Ferrari's 650 HP internal combustion engine and propellant to electric power for the performance demonstration. Equipped with the new LGM electric propellant system, the RIVA Ferrari was reborn as a noise-free / stench free environment-friendly powerboat that accelerates to more than 40 knots per hour within seconds. Dr. Kang, chairman of LGM said, "With the debut of LGM's electric powerboat system, LGM will enter into the U.S. market this year providing electric conversion services. LGM will replace old internal combustion engine yachts and powerboats to the LGM electric power system." The process of converting a boat's engine to electric using LGM systems and solutions is an easy process and costs are competitive to replacing old engines with new engines. LGM's electric inboard and outboard propulsion systems now range from 40 HP to 700 HP and also includes their Sailing Generation System that uses wind to recharge batteries while under way, eliminating conventional charging processes. LGM is communicating with potential partners in America for their conversion enterprise. This press release includes "forward-looking statements" within the meaning of Section 27A of the Securities Act of 1933, as amended, and Section 21E of the Securities Exchange Act of 1934, as amended. In addition to statements which explicitly describe such risks and uncertainties, readers are urged to consider statements labeled with the terms "believes," "belief," "expects," "intends," "anticipates," "will," or "plans" to be uncertain and forward looking. The forward-looking statements contained herein are also subject generally to other risks and uncertainties that are described from time to time in the company's reports and registration statements filed with the Securities and Exchange Commission.